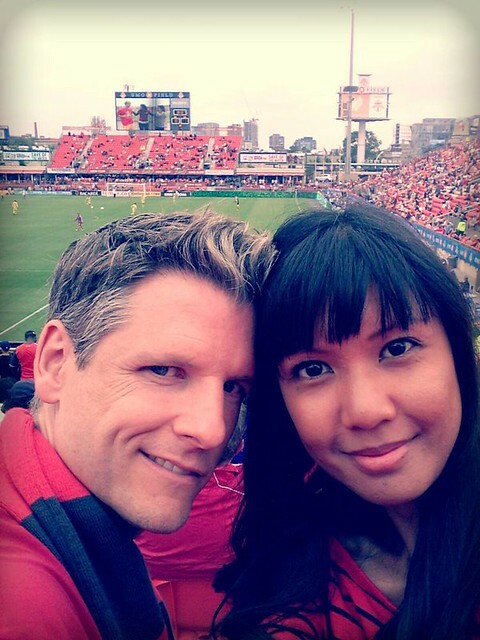 Elvis and I catch a TFC match from the supporters section at BMO Field at least once a season, but this year he was called out of town and couldn't make it. I still got the tickets though, and took my wife. Down 1-0 to Columbus Crew late in the 2nd half, the skies opened up. We got drenched, but we also got an unexpected surprise. TFC scored in the 87th minute to tie the match. The goal ended a goalless drought of more than 420 minutes. 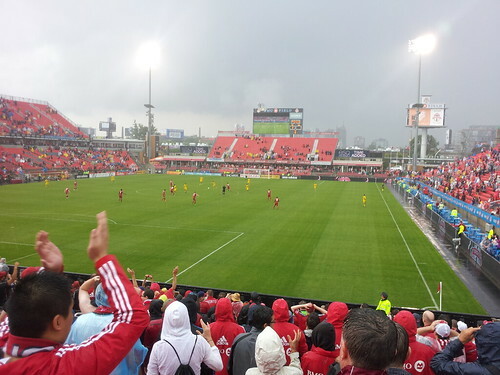 Then, with the rain continuing to fall hard, TFC scored again in the final minute of injury time for their first win at BMO Field in over a year. If you were at the last win too, I'd say we're on to something and can you get Leafs season tickets? Great game , glad you were there to enjoy the win. FINALLY!!! Even a blind squirrel finds a nut once in awhile. Seriously though it's about time! wait a minute.................I smell Instagram. Haha... I downloaded the pic from my wife's Facebook.